Amethi is a Lok Sabha constituency which covers the entire Amethi district and was created in 1967. The seat has almost always been held by the Indian National Congress (INC), save for a half-dozen years in the late 1970s and late 1990s. Rahul Gandhi held the seat for the longest period, from 2004 to present, most recently reelected in 2014, and the seat had also been held by his mother, father, and uncle. Its first member of parliament (MP) was Vidya Dhar Bajpai of INC, who was reelected in 1971. In the 1977 election, Ravindra Pratap Singh of the Janata Party became its MP. Singh was defeated in 1980 by Sanjay Gandhi of the INC. He died in a plane crash later that year, and a 1981 by-election was won by his brother, Rajiv Gandhi. Gandhi represented the constituency until 1991, when he was assassinated by the Liberation Tigers of Tamil Eelam (LTTE). The by-election held that year was won by Satish Sharma of the INC, who was reelected in 1996. Sanjay Singh of the Bharatiya Janata Party (BJP) defeated Sharma in the 1998 election. The widow of Rajiv Gandhi, Sonia Gandhi, then represented the constituency from 1999 to 2004. She was succeeded by her son Rahul Gandhi. Amethi has thus been represented by four members of the Nehru–Gandhi family. Presently, Amethi Lok Sabha constituency comprises five Vidhan Sabha (legislative assembly) segments: Tiloi, Salon, Jagdishpur, Gauriganj and Amethi. This constituency is surrounded by Bara Banki and Faizabad in the north, Rae Bareli to the west, Sultanpur to the east and Pratapgarh to the south. Rajiv Gandhi, the 7th Prime Minister of India represented Amethi from 1981 to 1991. Vidya Dhar Bajpai of the INC won the first election in 1967 and became Amethi's first MP. Bajpai held the seat and represented the constituency in the Fifth Lok Sabha. Ravindra Pratap Singh of the Janata Party represented the constituency in the Sixth Lok Sabha. Sanjay Gandhi of the INC won the election, but he died in a plane crash later in the year forcing a by-election in 1981. 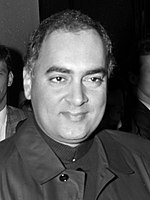 Rajiv Gandhi, Sanjay's brother, won the by-election and represented the constituency in the Seventh Lok Sabha. Rajiv Gandhi held the seat and represented the constituency in the Eighth Lok Sabha. Rajiv Gandhi won a third term in the election and represented the constituency in the Ninth Lok Sabha. Rajiv Gandhi won the election, but he was assassinated later in the same year forcing a by-election. Satish Sharma of the INC won the election and represented the constituency in the Ninth Lok Sabha. Satish Sharma held the seat and represented the constituency in the Tenth Lok Sabha. Sanjay Singh of the BJP won the election and represented the constituency in the Eleventh Lok Sabha. Sonia Gandhi, the widow of Rajiv Gandhi, won the election and represented the constituency in the Thirteenth Lok Sabha. Rahul Gandhi, Sonia Gandhi's son, won the seat and represented the constituency in the Fourteenth Lok Sabha. Rahul Gandhi held the seat and represented the constituency in the Fifteenth Lok Sabha. Rahul Gandhi won a third term as MP and currently represents the constituency in the Sixteenth Lok Sabha. ^ a b "Assembly constituencies-Post delimitation" (PDF). Chief Electoral Office, Uttar Pradesh. Retrieved 6 September 2014. ^ "Amethi: Gandhis to face first real fight". Hindustan Times. 4 May 2014. Retrieved 29 September 2014. ^ a b "Rahul Will Lose Heavily in Amethi: Kumar Vishwas". The New Indian Express. 18 March 2014. Retrieved 29 September 2014. ^ a b c "Three attempts were made to kill Sanjay Gandhi: WikiLeaks". The Times of India. 11 April 2013. Retrieved 29 September 2014. ^ a b "Assassination in India; Rajiv Gandhi: A Son Who Won, Lost and Tried a Comeback". The New York Times. 22 May 1991. Retrieved 29 September 2014. ^ Sharma, Rajeev (20 February 2014). "LTTE's messages show why Rajiv Gandhi's murder should be re-probed (Part-1)". Firstpost. Network 18. Retrieved 29 September 2014. ^ "1991: Bomb kills India's former leader Rajiv Gandhi". BBC News. Retrieved 29 September 2014. ^ a b c "Seven convicted over Rajiv Gandhi assassination set to be freed". The Guardian. Guardian Media Group. 19 February 2014. Retrieved 29 September 2014. ^ a b "An Amethi first in 10 years for Sonia". The Telegraph (Calcutta). 19 April 2014. Retrieved 29 September 2014. ^ a b "Does polls verdict signal decline of Gandhi dynasty?". The Hindustan Times. 17 May 2014. Retrieved 29 September 2014. ^ "Rajiv Gandhi (1944 - 1991): The Youngest PM". The Hindu. 9 June 2003. Retrieved 24 September 2014. ^ a b "Statistical Report on General Elections, 1967 to the Fourth Lok Sabha" (PDF). Election Commission of India. p. 168. Archived from the original (PDF) on 18 July 2014. Retrieved 30 April 2014. ^ a b "Statistical Report on General Elections, 1971 to the Fifth Lok Sabha" (PDF). Election Commission of India. p. 181. Archived from the original (PDF) on 18 July 2014. Retrieved 30 April 2014. ^ a b "Statistical Report on General Elections, 1977 to the Sixth Lok Sabha" (PDF). Election Commission of India. p. 185. Archived from the original (PDF) on 18 July 2014. Retrieved 30 April 2014. ^ "Statistical Report on General Elections, 1980 to the Seventh Lok Sabha" (PDF). Election Commission of India. p. 219. Archived from the original (PDF) on 18 July 2014. Retrieved 30 April 2014. ^ a b c d "Details of Lok Sabha By- Elections since 1952" (Excel). Election Commission of India. Retrieved 24 September 2014. ^ a b "Statistical Report on General Elections, 1984 to the Eighth Lok Sabha" (PDF). Election Commission of India. p. 215. Archived from the original (PDF) on 18 July 2014. Retrieved 30 April 2014. ^ a b "Statistical Report on General Elections, 1989 to the Ninth Lok Sabha" (PDF). Election Commission of India. p. 265. Archived from the original (PDF) on 18 July 2014. Retrieved 30 April 2014. ^ a b "Statistical Report on General Elections, 1991 to the Tenth Lok Sabha" (PDF). Election Commission of India. p. 280. Archived from the original (PDF) on 18 July 2014. Retrieved 30 April 2014. ^ a b "Statistical Report on General Elections, 1996 to the Eleventh Lok Sabha" (PDF). Election Commission of India. p. 423. Archived from the original (PDF) on 18 July 2014. Retrieved 30 April 2014. ^ a b "Statistical Report on General Elections, 1998 to the Twelfth Lok Sabha" (PDF). Election Commission of India. p. 246. Archived from the original (PDF) on 18 July 2014. Retrieved 30 April 2014. ^ "Statistical Report on General Elections, 1999 to the Thirteenth Lok Sabha" (PDF). Election Commission of India. p. 238. Archived from the original (PDF) on 18 July 2014. Retrieved 30 April 2014. ^ a b "Statistical Report on General Elections, 2004 to the Fourteenth Lok Sabha" (PDF). Election Commission of India. p. 309. Archived from the original (PDF) on 18 July 2014. Retrieved 30 April 2014. ^ a b "Constituency Wise Detailed Results" (PDF). Election Commission of India. p. 153. Archived from the original (PDF) on 11 August 2014. Retrieved 30 April 2014. ^ a b "Constituencywise-All Candidates". Election Commission of India. Archived from the original on 17 May 2014. ^ "Parliamentary Constituency wise Turnout for General Election - 2014". Election Commission of India. Archived from the original on 2 July 2014. Retrieved 31 July 2014. This page was last edited on 23 April 2019, at 03:17 (UTC).